Sara Poot Herrera has a PhD in Hispanic Literature from El Colegio de México and is a professor at the Department of Spanish and Portuguese of the University of California, Santa Barbara. 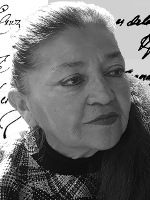 Her specialty is Colonial Novo-Hispanic and Mexican contemporary literature. Between books, book chapters, editions, essays, and articles, she has over 200 publications. She has served on juries for numerous national and international awards. Poot-Herrera is the co-founder and director of UC-Mexicanistas, an intercampus research association on Mexican studies, within and outside of Mexico. She has been recognized with various awards in Mexico and California, and her university gave her the Outstanding Graduate Mentor Award. Journey through the work of the Mexican writer Margo Glantz in search of the influence of her family and cultural environment —as a child of Jewish immigrants in Mexico City at the end of the second decade of the last century— in her ample literary production, considered from the perspective of one of her distinctive features: her constant trips through the world and the narrative emanated from them. Recorrido por la obra de Margo Glantz —hija de emigrantes judíos a la Ciudad deMéxico al final de los años 20 del siglo pasado—, en búsqueda de la influencia que sus orígenes familiares y culturales tienen en su amplia producción literaria, y planteado desde la perspectiva de otro de los rasgos fundamentales de la escritora: sus continuados viajes por el mundo y las narraciones que de allí emanan.